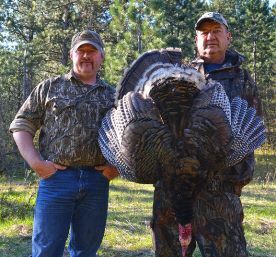 Guide Larry Bennet and Dennis Foster of DakotaPheasantGuide.com show off the Merriam’s gobbler shot at 13 steps int the Black Hills of South Dakota. The idea to head to the Black Hills on a Merriam’s hunt spawned from a conversation during a February ice-fishing trip. A friend of mine, Dennis Foster, and I were targeting pike and walleye through the ice on a small pothole in the Glacial Lakes region of northeastern South Dakota, and somehow our conversation drifted west nearly 350 miles as the crow flies to Black Hills turkeys. For more information on hunting the Black Hills, go to the South Dakota Game, Fish and Parks Department website at gfp.sd.gov, refer to the U.S. Forest Service website at fs.usda.gov/blackhills or visit the Historic Deadwood’s website at deadwood.com. About the Author: Andrew Johnson is editor of Outdoor Forum. Contact him at ajohnson@aberdeennews.com.